Here is my stab at the Build a City Challenge. I'm playing it more as a goal-oriented challenge than a means to tell a story, so the population may grow faster than what some might consider realistic, but hopefully not too much so. Last edited by Lorinsv on September 23rd, 2017, 7:59 pm, edited 31 times in total. I've been following this for a while, and I've really enjoyed it! Lorin, you're neighborhood is da bees knees! I love how the genetics of the town are very unique, and not cliche attractive. Yet looking at families like the Shin family, we can see a lot of attractiveness. I'm excited to see the future generations. I want MOAR! No pressure though, I am truly kidding though. Your updates are long enough that they are just too good! Call me Micah or Ultimo. Never Mike. Just no. I've been thinking about your comment, and I have to say I'm pleased with the town's genetics too, they make Mesa Vista seem like any town you might come across. You make a really good point that attractive does not have to mean conventional beauty. To me, personality and getting familiar with their life situations are as much if not more a determination of what's attractive. Thanks so much for leaving such a nice comment! I've started playing the next household (Yvette "the hair" Tan ), so hopefully it won't be too long before another update. All caught up! Nice updates! The Messlot house is starting to look decent! Fun seeing the Shins take so many vacations. Too bad about the Hang Loose, though. Everybody in Willow Valley does it like crazy after just one vacation. Rebecka's doing quite well - just moved in and already topped her career! It's always nice when you can hack the community lots that way. Noooo, don't say that! Not fair! Diane has a couple more ideas to learn how to Hang Loose, and Felicia here at boolprop suggested just moving a local in, which I will do if nothing else works. What a strange week! Yvette certainly is one of a kind. Her hair still makes me laught, though. I like Meadow and her Art Gallery! That's a really nice set up for the gallery, as well, might have to steal that one in due time from you and Nemo, haha. How come the customers won't pay for their make overs? I've never had anything like that with my sims' salons... Is it a glitch? Yes, definitely a strange and difficult week! Lol, Yvette's hair never ceases to amuse and amaze! You should definitely try the Art Gallery! I just copied it from some pictures, and it worked great! Don't know if you saw, but I finally got my salon problem solved (see here). It'll be a lot more fun playing it in the future. Annnnd I already haz another update! Daniel is a cutie! 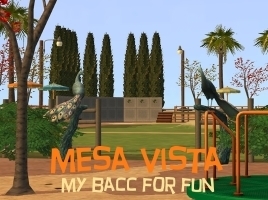 I love Mesa Vista. I also like the community church wedding - question: did you have a community lot wedding hack or did it work just like this? Daniels 'Fetti' exclamation at his birthday first confused me, than made me grin... in German, 'Fettie' (with -e, but still...) means 'Fatty', but... Con-fetti-gratulations for growing up in such a wonderful family, Danny! 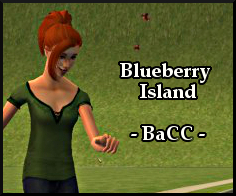 Tan: I love Yvette's crazy hair, even if she is the weirdest family sim ever. Also, Meadow Pederson! She throws awesome kids (I know, I've got six of 'em), so it's good she's more of a family sim than Yvette. Ramaswami: I love the look of the house makeover. It's fun sometimes to makeover Maxis houses, although for now I'm limiting that to Uni in my BaCC. I love Priya's new look! Thank you, so happy you liked it! Thanks so much for the houseplan too, I will definitely use it for inspiration the next time I need to build a house! Yes, Ryan is such an all-around nice guy, from the moment he picked up Maddie's trash can the first time he stopped by her house. Nellie's great too! I don't have very many blondes in MV, I think that's one reason she's kind of special to me. You get exactly where Ghost-Dad Neil is coming from. I'm glad he got to stick around Mesa Vista a little longer, and I'm looking forward to having him haunt MV's cemetery! 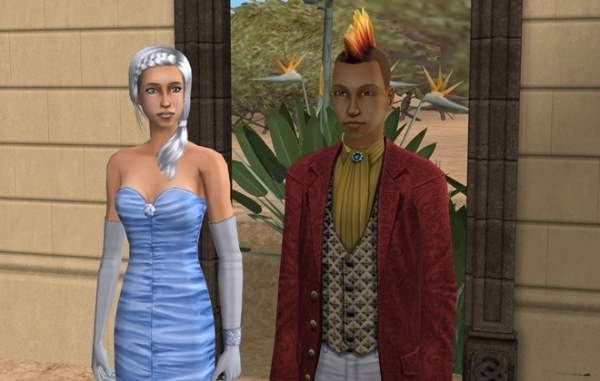 I think it was an EP that allowed community lot weddings, no hacks that I remember in my game in relation to that. I read that the only problem is sometimes the rings remain engagement rings instead of becoming wedding rings, but I didn't have that problem. It's nice to have some normal households to play between my challenge ones, so yeah, Danny's pretty lucky. I love Yvette's hair too, it's gotta be one of my all-time favorites! Of course, I knew Meadow Pederson seemed more familiar than just one of the common AL townies. Now it'll be even more fun reading about her in Willow Valley. I seem to be doing more home makeovers than usual lately. The Fiesta Fortress was a lot of fun, I immediately saw courtyard potential for the Ramaswamis with the gated entry. So glad you like Priya's new look! It's the first occasion I've found to use that Maxis hair, which I like the style but hate the texture. 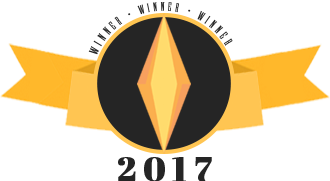 I may have to take a look to see if it's ever been retextured. I love Nellie and Ryan's relationship too. He's turned out to be such a great Sim to play. Gotta love the BaCC for making those large chance card bonuses really count! The Korbens are AWESOME - each one of them! The redecoration of the house is also great - I like the clear, strong colors in the rooms and the wooden floor gives this a real desert look - and the stonewall behind the kitchen counters accentuates the 'it's a kitchen' feeling. The interior decorations works really well, giving the rooms a 'we're living in here' -feeling. The Korbens have really made a lot of progress in two seasons! And now I want to try this challenge. I think having a teen to start is pretty much a necessity, though - I can't think how a family would survive without one. Anyway, the house looks awesome! Good for Ethan using his money to help the family out. And I like the idea of him being an auto mechanic - seems to suit him. I've been to a few back in the day (completely sober, I might add): Most notable were Tom Petty, Yes (my favorite concert) and AC/DC, before Bon Scott's death. They played at the UNR old gym, which was not an overly huge venue, and they were so frickin' loud, my ears rang for four days after! See the picture on the left underneath "1974-80: AC/DC"? That's EXACTLY what it looked like, complete with guitarist Angus Young hopping around, flinging his head back-and-forth, back-and-forth while he played. I can do that maybe 3-4 times before my head starts hurting, and he did it the entire flipping concert!! TBH, I don't think there's anyone these days I want to see live well enough to go to the hassle. I think the only way the family could make it without starting with a teen, is if the parent married in a spouse early on. Someone in the Broken thread at MTS did that, but I wanted my family to make it on their own first, since I'm a sucker for stories about people overcoming adversity. If I were just playing the Broken challenge on its own, I probably wouldn't have taken advantage of the Restorable Car for the large chunks of cash. Buuuuut, since I'm racking my brains for different business ideas in Mesa Vista, I was more than happy to utilize the car to that end for Ethan, and I felt it was still in keeping with the spirit of the challenge. I'm glad you like the house! I'm pretty pleased with it, considering I built it on the fly as they could afford it. Thanks for reading and commenting! I look forward to seeing you play this when you get around to it! It's one of the better hardship challenges (sans the creator's backstory, which is a bit too grim for how I'm portraying Mesa Vista) especially during the first week, and probably quite a bit longer without the significant cash infusions from the car. It's nice to find some good short-term challenges to shake up the rotation and make my families a bit more unique in my head. I love this family! Such a fun challenge as well. And you've made the house look super cute. I really like your decorating style. Ethan is doing really well with those cars! Thank you, Anne. I love your BaCC too!